is now coined My Memorial McCalls Dress since I was able to sew 3 dresses over the Memorial Day Weekend. 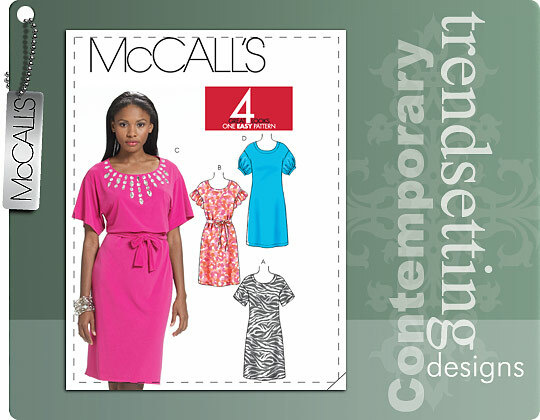 McCalls 6026 is a close fitting pullover dress with sleeve variations and a self-belt. Were the instructions easy to follow? I pinned the instructions to my inspiration board, looked at the fabric layout and forgot about it. What did you particularly like or dislike about the pattern? I like the simplicity of the dress. After looking at the cover pic closely I realized I did not like the sleeves. I added lace to the lining hem. To keep the lining from rolling to the outside of the dress, I did an edge stitch. Would you sew it again? Would you recommend it to others? I think after making 3 dresses, I would like to sew up the other dresses in my sewing que. Conclusion: With the weather warming up considerably, I was looking for an effortless pullover & easy-breezy style dress for work. I wore the black/white one today and it was perfect. You know I am mad at you, or more like jealous!!!! I love all 3 of your dresses and they look fabulous on you. To know that you got 3 dresses done this past weekend is making me ill because I got absolutely nothing except laundry. How exciting is that LOL!!! Great dresses, I like each one of them. Sounds like a perfect sewing weekend. You are right! Your dresses look nothing like the pattern envelope - but much, much better. You have this one down pat. Love the first one with contrasting hem. I love all of these, great job! Those are great easy, breezy dresses! WOW three dresses in one weekend I am impressed! Love all three of your dresses especially the one with the border print at the bottom. Great looking dresses! You did a great job on all of them. They look good on you! Thanks so much for stopping by and commenting on my blog. I really want to get into sewing, so I will be adding your blog to my reader. I will need all the help I can get...LOL! I hate people with talent,taste, a good eye for color, and a sense of style, and for people who don't mind sharing their passion for their craft. OK now that has been said. I hope I wasn't too hard on you. I am in love with those dresses you look wonderful. You make all this look so uncomplicated. I love what you do. You, Mimi, Adrienne, Carol, Erica B are my favorites. DIVA-ISH. Adorable dresses - I love the tailoring you put in to your clothing!! Very nice dresses and a nice pattern. I particularly like the dress with the border at the hem, it looks very elegant! Wow, your dresses are much nicer than the envelope. Great job! WOW you were able to accomplish all those dresses this past weekend! I'm jealous too :) They look great! @ Mary Sarah: I didn't get a chance to go Bar shopping since I became obsessed with McCalls 6026... hopefully this coming weekend. @ Virginia J: You were not hard on me... how could you with that awesome compliment. 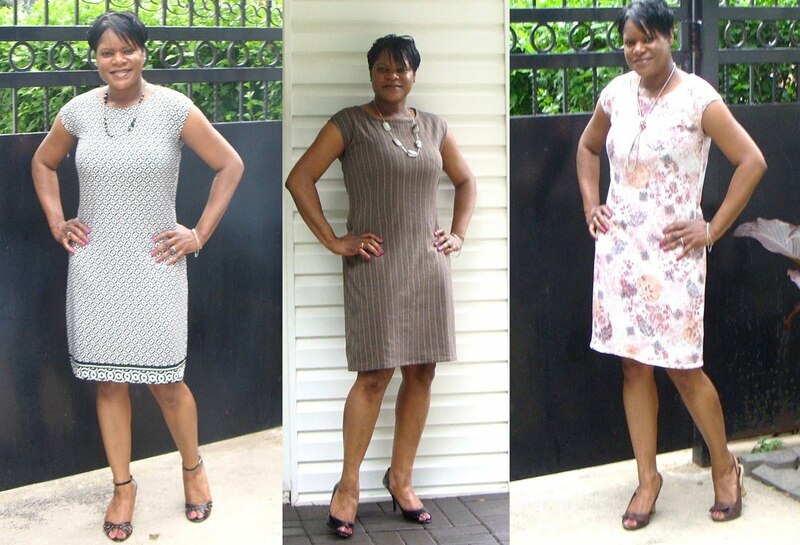 @ Pammie: I like easy garments, but realized that most of my garments need some shaping and the darts help tremendously. I even surprised myself that I was able to complete the first dress in under 3 hours. Thereafter my mind started churning over the possibilities and immediately went in search for more fabric. The Floral dress took a lil longer due to the lining, but my favorite is the pinstripe dress. Very nice Sheila as always! Keep up the good work! Nice dresses and perfect for our NYC weather. Thanks for your compliment on my blog.I love the modification you made to the dresses. So Chic! I'm glad that you showed how this dress pattern can become a cap-sleeve garment. That is a terrific tnt dress pattern that you can turn to time and time again, when you need something quick! Very nice. Girl, looking fabulous as always. 3 dresses i on e weekend. That is called "taking the pattern to the max". Great job! All three are gorgeous and I love how you used the border print knit! You have been on a roll! Wow, you are FAST. All the dresses look great -- perfect for summer. I love these dresses. I think the fit is wonderful on you and the shape very flattering. And three in one weekend? I'm impressed! Ok...I'm still dancing in my seat from your music. You are going to be the snazziest in your office! Shelia, I don't sew dresses, but looking at your blog you make it seem possible!